Siblings Maryam (’92, MS ’95) and Reza (’86, MS ’88, PhD ’98) Rofougaran are internationally recognized leaders and innovators in communication technologies. They made an impact on the wireless industry by pioneering the development of RF CMOS, a low-cost, high-volume digital processing technology, across cellular, Wi-Fi, Bluetooth, GPS, and near-field communication, to name a few uses. Most recently, Maryam and Reza co-founded Movandi Corporation, a venture-backed startup that is unlocking the potential of 5G and next generation communication. Their company provides integrated RF, antenna technology and systems to meet the demand for high frequency, millimeter wave performance. 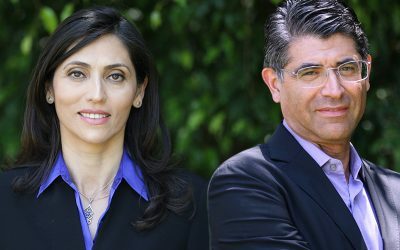 Previously, Maryam and Reza co-founded Innovent Systems, which was acquired by Broadcom in 2000, creating the largest supplier of wireless connectivity technology. Maryam is an inventor or co-inventor on more than 260 U.S. patents, and has been recognized as one of the 50 most powerful women in technology by the National Diversity Council. Reza holds over 800 patents, placing him among the top 10 patent holders in the U.S. and in the top 20 worldwide. The Ronald and Valerie Sugar Distinguished Speaker Series brings world-class technology leaders to campus. Geared primarily towards UCLA Samueli students, the series encourages dialog on current engineering topics.